Enthusiasts commenting about friendly park staff almost always use Holiday World as their benchmark. However, the wonderful people at Adventure City give them some real competition. When I bought my ticket I was immediately spotted as a coaster enthusiast and offered discounted admission, a particularly nice touch. The nice lady even commented that I'd probably be in and out in ten minutes, and asked if I was en route somewhere else! 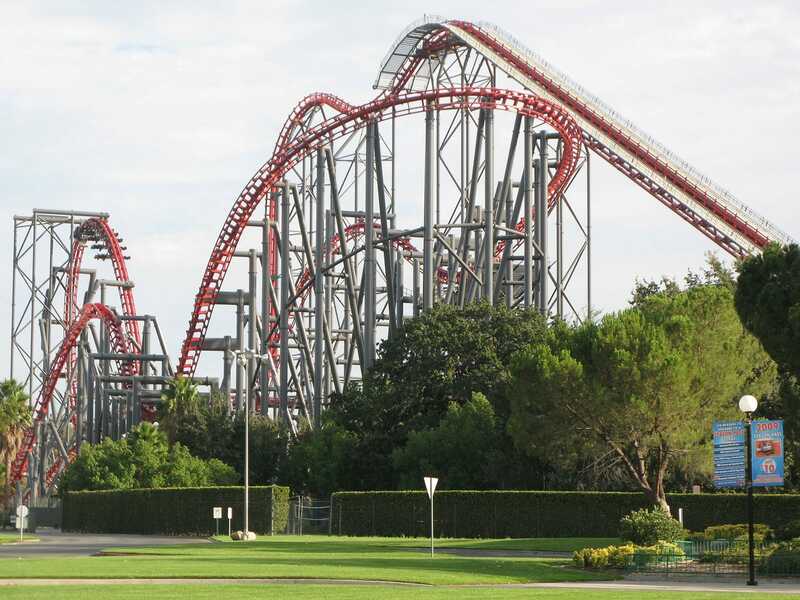 The Freeway Coaster (#1460) is the smaller of the two credits in the park, yet considerably more lively than its size might have suggested. The Tree Top Racers (#1461) was also a particularly energetic ride, and its uniqueness value made it one of the best wild mice that I've been on. Knott's Berry Farm was not a planned stop on my itinerary today, but as I was driving directly past it seemed rude not to stop. My sudden decision cost me an absolutely outrageous $66 including parking, leaving me with a sour taste in my mouth even before I'd made it through the gate. Having said that, even if I'd made advance plans the visit would probably have cost the same, thanks to Cedar Fair's online ticket system requiring an American credit card. With prices like these amidst a recession it was perhaps no surprise that the park was largely empty, with all the coasters being walk-on. I made my way through the remaining adult coasters (except the Boomerang!) over a period of 40 minutes. Of particular note was Silver Bullet which seemed much more intense than I remembered, with the blood running to my feet through some of the manoeuvres. Having said that it could well have been due to jet lag, as by this stage I'd been awake for almost twenty-four hours. I was fortunate enough to time my visit to LA with a Season Pass Appreciation night at Six Flags Magic Mountain, which in reality meant no more than a thousand people in the park. Better yet, the park was fully operational, and with sixteen coasters this meant there were no queues anywhere, a rare treat in a park like this one. Fatigue prevented me from staying until close, but despite only being in the park three hours I still managed seven coaster rides, including four laps on the superb new Terminator Salvation (#1463). The latest new ride from Great Coasters International is the first wood coaster anywhere to feature an on-board audio system, and to be frank this is pretty close to pointless. 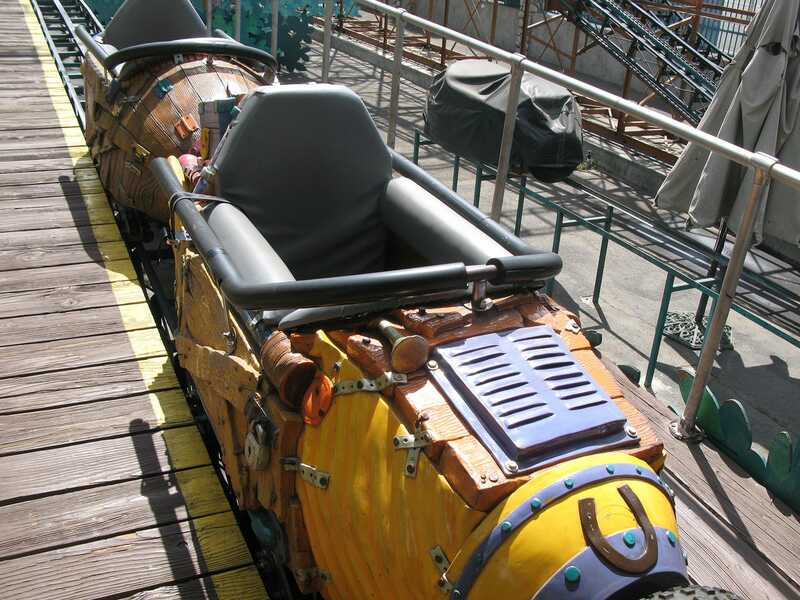 Once the train clears the lift hill the wood coaster rattle drowns out anything that one might have hoped to hear, and nobody seems to pay any attention to the audio on the lift hill or the brake run. Once you disregard this though the ride is well up there with the best coasters GCI has come up with, making a fine replacement for the awful Psyclone. The non-existent lines even extended to X2, though in this case it was with good reason. I'd not ridden this ride since its makeover, and frankly I'll be a happy man if I never board it again. The new soundtrack is the only good feature of what is a truly awful waste of valuable steel; I particularly enjoyed hearing a random female voice remark whose idea was this anyway two thirds of the way up the lift hill. However, even the inside front seat (which I'm reliably informed is the smoothest) really hurt me; the sensations generated by the ride are very cool, but the overall ride quality is truly horrid and spoils any fun that might otherwise be had. The nice thing about the coaster enthusiast community is that you never know who you might run into. Tonight I ran into Tim, who I'd last met at Myrtle Beach a few years ago. In a break with tradition he wasn't brandishing a camera, his plan being to do his photo run tomorrow. If I didn't have to drive forty miles to my hotel I'd probably have spent the rest of the evening at the park with him, but even with an extra coffee it would have been too dangerous to do that. As such, I completed the night with a quick lap on Ninja and a ridiculously intense lap on Tatsu. The pretzel loop on the latter was almost too aggressive, and I'm not at all sure that I could have coped with a second circuit.